A certain boy and a certain little bear continue to capture the hearts of children all over the world. While nothing can compare to the original classics written by Milne, Disney's animated versions of the story capture the essence of the books and feature the same delightful quips and sayings so completely and utterly Pooh. The newest Disney Pooh DVD is extra sweet. Just in time for Valentine's Day, Disney DVD re-released two love-inspired animated specials on January 5th, 2010. In Winnie the Pooh: A Valentine for You Special Edition , the silly old bear and friends gather in 100 Acre Wood and celebrate all things Valentine related -- sweets, cards, friendship and love. The main feature on the DVD is titled, "A Valentine for You." According to Pooh, it's the saddest Happy Valentines day he can remember. With Valentine's Day only a day away, Pooh and friends search for Christopher Robin and spy him writing a letter to his newest friend, a girl named Winifred. Convinced they've lost him as a friend, they conclude that he's been bitten by a "smitten," a member of the love bug family. The friends embark on a journey into the heart of 100 Acre Wood on a search for another smitten to unsmit him and "debug the boy" for good. Along the way they discover that new friends don't necessarily replace old friends -- there's a place in the heart for both. My kids found plenty to laugh at in this Valentine's Day Pooh adventure. The idea of a love bug called a "smitten" is so like Pooh. Little touches like poison-ivy forget-me-nots and several cute songs make this special beyond adorable. The segment was originally released in 1999 and includes three amusing and heartwarming songs, "Girls Are Like Boys," When the Love Bug Bites," and "Places in the Heart." The other segments on the DVD aren't as high of quality but, like the first, they still entertain and delight. The first two are from the TV show, "The New Adventures of Winnie the Pooh" and aired in 1989. "Un-Valentine's Day" - After receiving too many Valentine's day cards in the previous year, Rabbit calls a meeting and cancels Valentine's Day, banning the exchange of cards. Despite the ban, Pooh receives a jar of honey Valentine and feels the need to reciprocate the kind gesture. The others get caught up in the giving. They act out a live Valentine in a special and silly performance for Christopher Robin, complete with a cupid Piglet and special "defects" using gun powder. Finally, at the end, they discover who originally broke the no-valentines promise. "Three Little Piglets" - In this episode, Pooh delivers a marvelous, crazy and mixed-up retelling of the story of Three Little Pigs. His version includes a honey tree (of course), three piglets, a big bad bunny with big ears, a masked offender, and a papa bear. The huffing and puffing has never been sillier. A fun story provided that the watcher is familiar with the original telling. "My Hero" Bonus Feature - Piglet saves Tigger but doesn't especially appreciate Tigger's overwhelming way of thanking. As another bonus, there's also a "Catch The Love Bug" Game. Watchers use the DVD remote arrows and try to catch loose love bugs. We didn't find the game overly exciting. 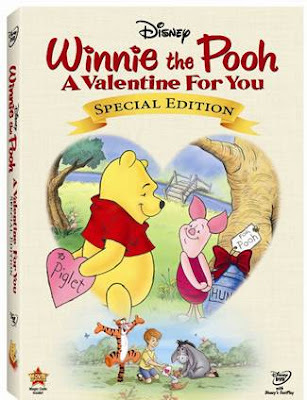 One of the coolest things about the DVD according to my daughter is that it comes with six small Pooh valentines that she can share with her friends. She already has addressed all six of them. We especially enjoyed the first segment with the all the songs and the "smitten" bug. Pooh fans will appreciate the chance to own this DVD re-release. Prepare for a "terrifical" and bear-y special Valentine's day treat if you elect to watch it! Don't forget - A.A. Milne was born on January 18th, 1882. Winnie the Pooh Day, held on every January 18th, celebrates all things Pooh. How will you celebrate? I love the idea of doing something special to celebrate A.A. Milne's birthday. I will have to post about it on January 18th. Thanks for the heads-up!